The Wayfaring Baddorfs: South Pole Achieved! The South Pole!! BOTH of us are at the South Pole preparing to work through the winter at Amundsen-Scott South Pole Station. So excited. Before I was able to join Sarah I worked at McMurdo for two weeks learning a little bit about my job and how things work down here in Antarctica. Not only is most everything quite different but the people themselves are a little bit out of the ordinary too. "Look who's talking" you might say to me and you would be right to suggest that both Sarah and I have made some not-so-ordinary decisions over the past few years. One common factor most Antarcticans (there are no native people from the continent so this is an affection term for those of us who are here now) share is enthusiasm for being here and overall a desire to explore. Just over the little time we have been here we've met people who have hiked the Pacific Northwest Trail, climbed various mountains, are a part of groundbreaking science (a lot of that here), who have traveled to almost every country you can think up and so you did not even know existed, and more. McMurdo has a nice mix of Kiwis who work there as well, not to mention they have an actual base just around a big hill. Having lived in New Zealand for a year it has been fun to spend a good amount of time around some Kiwis again. I actually met a few who know a friend of mine from seminary who is a chaplain in the New Zealand Airforce - how cool is that? So while Sarah was at the Pole working and waiting for me, I was doing my best to experience anything there was to do and see at McMurdo. See the last post for more of those fun times. The day before I flew up to the Pole I was given the day off for having worked my day off during the vessel offload the week before. I was hoping to find someone who was willing to do a specific hike with me called Castle Rock as you are not allowed to do it on your own. Leave to the Kiwis to help me out there too! With a little bit of inquiry it turned out their group was thinking of doing it too and so we decided to meet and go for it. I was hoping the guys I had been chatting with for the week would make it too but they maybe imbibed till the late hours of the morning, allegedly, and so it was me and two of the ladies I had been working with in supply. We signed out at the firehouse, took the required supplies and started our hike. Which if you have noticed all of the pics from this post so far are from that hike. The second is Castle Rock. We did a quick out and back instead of the nine mile loop and settled for a nice six mile hike, which also included climbing to the top of the rock when we got there. The third pic shows a part of that climb and the view of Mt. Erebus in the distant background letting off some volcanic steam. Great hike, wonderful group, a lunch in the emergency warm up shelter, and stunning views. Overall great weather and spectacular way to end the time at McMurdo. Then yes it was time to fly to the South Pole! And on this sweet LC 130! A quick three hour flight with a few other people and, you guessed it, with some fantastic views. The next two photos were taken from the cockpit over the Trans-Antarctic Mountains. I am glad I did not have to cut a way through those trying to find the South Pole as Amundsen and Scott would have had to in their race over 100 years ago. This shot was taken after we had landed and were still gliding down the ice runway. They started opening the cargo bay door to make sure everything was ready to go. The goal is to get the plane back up in the air as quickly as possible for various reasons. What an experience! Then it was off the plane and walk to meet Sarah, who in the next picture can be seen waiting for me in the distance. I did not know it at the time but when I took this picture of the plane before heading up to the station, I snagged a pic of Brian as well. He is the man who I had to convince to hire me for this job and works here throughout the fast paced summer months to get a lot done. He will leave on the last plane out and then it will be up to the logistics people he has hired, like me, to keep the train going through the long Winter months. There's Sarah can you see her? Way up in the red coat! Should have put Sarah in this shot too but this was my first time here and she was taking the picture to mark the occasion by the welcome sign for the base. Not the best focus but on the way in to the station I saw my first Antarctic sundog! Wow. I saw a few in the Arctic this past year but none that were quite this full forced. I took it as a personal welcome from the South Pole. Sarah toured me around the station, started making me drink tons of water (we are at just over 9,000 feet at the Pole but the pressure and other factors make it feel as though you are at different elevations, which has been over 10,000 feet since I got here), I met a bunch of people, and we settled into life here. The next day was fortunately Sunday, our one day off each week, and I was able to take a day to acclimate before heading to work. Sarah and I were lucky enough to go out for a tour of one of our satellites here on station. This particular one looks at light emitted from the original big bang (or as I like to think of it as when God spoke the universe into life - boom) and is studying it for all sorts of reasons. Then there is another project that uses this satellite (we went to a lecture on it later that night) to try and study black holes, with the goal of getting the first real image of one. Cool stuff. 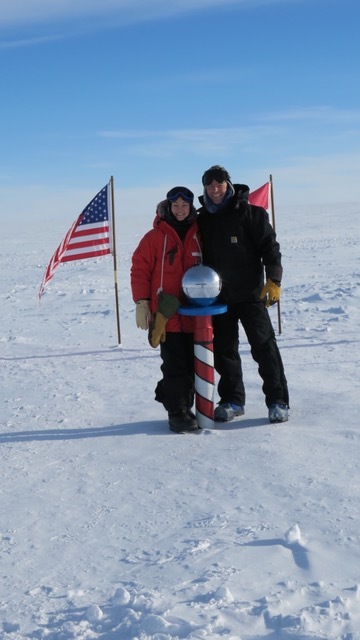 On the way back we stopped at the ceremonial pole (the one with the flags) and the geographic pole (the one that our station which is on moving ice slowly moves away from each year) and took some pictures. First is the Pole marker. Every Winter the team puts their hearts and minds together and designs the next years marker, as it has to move anyway, and the tradition continues as the Summer crew puts it out. Sarah waited for me to see the new marker from this past year. I'll try to get a better pic of it later. Then we had to show you we are on the bottom of the world - literally. Then a regular pic. So happy to both be here. Oh this pole marker pic is a little better. Then work. Here are some images from the area I work in. I'll do one soon on the medical clinic! And today I was trained to drive these machines!! I don't even know their real names yet but it was super fun and I can't wait to get moving stuff with these bad boys! That little guy moves quick compared to the big guy, but it can't carry nearly as much weight. Does anyone else think we just took over Hoth base and made it into the South Pole station? Well as always more to come in the future when we get time. Plenty of work needs to get done and the internet does not like us here too often. Keep checking back for further posts on life down at the South Pole this Winter.